High school students at the Sheraton Hotel in NYC. Photo Credit: Newsday / J. Conrad Williams, Jr. The City Council is considering a measure that would lower the minimum-age requirement -- from 18 to 16 -- for anyone serving on NYC's 59 community boards. Sixteen-year-olds may have the unfortunate reputation of being too self-absorbed, even being troublemakers. At 16, I was definitely of the troublemaking variety. Introduced by Council member Ben Kallos (D-Manhattan), the legislation has about 12 sponsors and calls on the State Legislature and Gov. 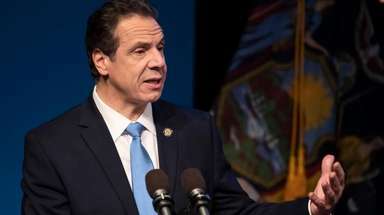 Andrew Cuomo to approve the change. If a high schooler is serious, attends community board meetings, and is deemed worthy to be appointed by the borough president, then why not? Borough presidents appoint members to boards, basically citizen-advisory councils. A 16-year-old named Scott Stringer received special permission to serve on his community board in the '70s. He went on to be elected Manhattan borough president in 2005 and NYC comptroller last year. We should reform the system and allow more young people to serve. Right now, about 20 percent of NYC's population is younger than 18 -- a large number with no say in the decisions of their community boards -- but only 6 percent of community board applicants in Manhattan were between the ages of 18 and 24. One of the guidelines for board nominees is that members live, work or have "significant interest" in the community. High schoolers are a big part of our community, and they would be the only people on the board actually attending one of the community's schools. Chances are that when prospective members turn 18, they would head off to college. So while the current minimum is 18, I can't imagine many college and graduate students having the time to serve. High school students toil hard, for sure, but they don't have the demands of college, or struggling to work and make ends meet in an extremely expensive city after they graduate. I might consider serving on a board, but it's extremely time consuming and I just can't do it (unless community board meetings offer child care. Just saying). And I'd rather have a 16-year-old speak for me than some of the people I've seen serving on the boards.